SNOW is a science. If you thought those fluffy six-sided crystals that fall out of the sky are the same wherever they land, ask a skier. They will tell you why Colorado is king. This being the good old US, you factor in the sort of colossal investment which would build all of Ireland’s sporting infrastructre, and you have the reason why Vail is so attractive to the European skier. The resort makes its first appearane on Irish brochures this year, served through London to Denver, a destination that will become more accessible should Aer Lingus’s ambition of a direct service eventually reach fruition next season. 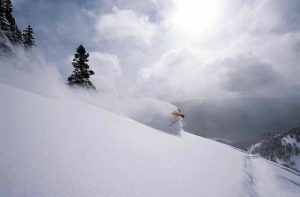 The renowned Black Bowls and Blue Sky Basin have seen investment of $55m in the past few years. There is a planned investment of $200m in Lionshead, concentrating on leisure facilities. 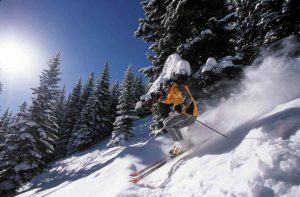 It is Vail which has the biggest skiing area. It is laid out so that the experienced and inexperienced alike can cover miles on their excursions. Americans measure their ski areas in acerage, rather than length. And afterwards there are pubs to check out such as the Red Lion, where Phil Long has bought his own pub having played music for 14 years. You can still find him in action at his own pub in the afternoons, doing covers of Dire Straits, Led Zeppelin and Don McLean. At this altitude, one beer does the job of three. People occasionally suffer because Vail checks in at higher altitudes than we are used to in Europe, even for veterans of Val Thorens. A series of dry winters in Europe in the 1980s sent skiers across the Atlantic in search of a Promised Land of powder. 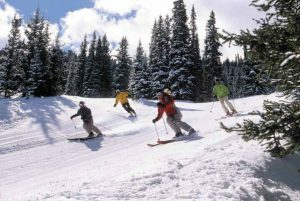 They discovered Colorado, a revelation in user-friendly skiing. Instructors didn’t say: “line up, follow me”, but “what would you like to learn, sir?” and “hey! – you’re a great skier”. More importantly, on Colorado’s combed corduroy, skiing was easier than in Europe. A decade ago winter holiday-makers booked a year in advance. Five years ago the lead in time fell to six month. Two years ago it was three months and nowadays a growing number of people are “chasing the snow”, waiting for forecasts before booking, had increased. But long term booking still makes sense. And remember that April is the month with the second most snow, March is the snowiest, followed by January then February. Red Lion: www.redlion.co. Bar owner plays guitar. Mickey’s Piano Bar upmarket place to hang about after skiing. Sports Bar in Evergreen Lodge pool table and good drinking.